A comprehensive study of a little-known area of Guatemala, this book is an invaluable contribution to Maya studies. The author’s attention to ethnographic detail is revealed through the text, diagrams, and the astonishing photographs, which set a new standard for documentation. At the same time, the succinct style of writing assures the accessibility of the book to non-specialists. Highly recommended. This outstanding work documents traditional religious specialists and their practices among Chuj, Q’anjob’al, and Akatek Mayan speakers residing in the remote fastness of the high Cuchumatan mountains in northwest Guatemala’s department of Huehuetenango. Detailed and specific, the book is long on data and thankfully less concerned with analysis. It is invaluable as a record of disappearing traditions and equally valuable as information contributing to understanding the meanings of related traditions placed in context and explained by followers of those traditions. Archaeologists and epigraphers will find careful descriptions of material goods and fascinating practices that may help identify excavated materials and activities from earlier times. Ethnohistorians will be pleased to find that Krystyna Deuss discusses relevant materials provided by earlier ethnographers and has numerous comments on ritual practices, when some of them originated if known, and when some practices were no longer present. Art historians will encounter images and their descriptions that beg comparison with images from Classic period iconography, as, for example, with the sacred bundle associated with change of office rituals, or the placement of altars and crosses as approaches to the supernatural world, or the staff of office carried by community authorities. Anthropological linguists too are provided ample material for identification and analysis, such as an appendix of prayers and invocations in the original Mayan languages as well as in English translation, and Deuss supplies much of the necessary context for more fully apprehending their meaning in the book’s main body. Social anthropologists will of course also find the data fascinating, given the book’s painstaking and well-illustrated descriptions of feasts and festivals, life crisis rituals (including birth, baptism, marriage, and the Day of the Dead), and rituals for planting, rain, preventing frost damage, and maintaining and renewing the health of the community. Descriptions are also given for ritual cleaning of the sacred bundles and for closing-the-year ceremonies that entail cutting new staffs of office, cleaning the prayer-sayer’s house, and closing the altars. Based on fieldwork spanning some thirty years, beginning in 1974, this book is written in the first person, in a straightforward narrative style, making it both interesting and easy for the reader to understand. One of its standout points is that it is exceptionally well illustrated, with fifty drawings (including four maps) and a hundred photographs, all of them relevant and well chosen. The drawings are particularly useful for grasping the details of placement and the positioning of individuals during ritual activities as well as of the ceremonial paraphernalia used. The communities selected for description are Santa Eulalia, Chimbán, Soloma, San Juan Ixcoy, San Sebastián Coatán, and San Mateo Ixtatán. It is a rare bit of good fortune for Mesoamericanists that Deuss has provided such a detailed report and of a topic that was not part of her original intent. That intent had not been to examine the shamans, daykeepers, prayer-makers, and witches of the region, but rather it had been to collect village costumes to examine how they evolved during the twentieth century. However, her original interest in clothing led her to meetings with traditional religious functionaries in the several communities that she visited, and these encounters led in turn to her being allowed to witness rituals no other outsider had ever seen. This opportunity, combined with the eye of a keen observer and the inquiring vision of an excellent ethnographer, has given us an invaluable contribution to the ethnography of this Mayan region, one that will surely endure for its exemplary description, its methodological insights, and the fascinating customs and traditions themselves that are so clearly presented. The intrepid Krystyna Deuss has done it again. 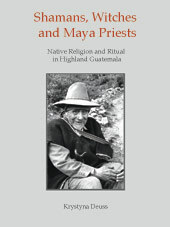 Following on from “Shamans, Witches, and Maya Priests” (2007), in which she recorded and so rescued from oblivion traditions of religious ritual in six Maya communities in the Sierra de los Cuchumatanes, Deuss casts her incisive eye on another twenty-eight Maya communities scattered throughout highland Guatemala. On this occasion her gaze is on cofradías, religious brotherhoods charged with enacting ceremonies that reflect native spirituality and worldview, at the same time affording community members assurance of a cherished place in the scheme of worship. In “Cofradías,” Deuss pays homage to the resilient, resourceful, ever-changing Maya of Guatemala, with some 250 photographs illustrating beautifully their acts of belief. This is an outstanding contribution to the field. 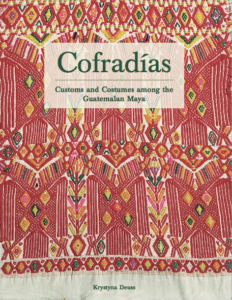 Cofradías have been an important means for preserving Maya traditional world view and ceremonialism for centuries and this is the most comprehensive overview of the most significant highland Maya communities that maintain cofradía worship that I’ve read. This is particularly important as many of these traditional ritual practices that have been observed for generations are being forgotten. You have a wonderful eye for details that often escape even veteran researchers. I’m sure that this book will be highly valued and consulted for many years to come.